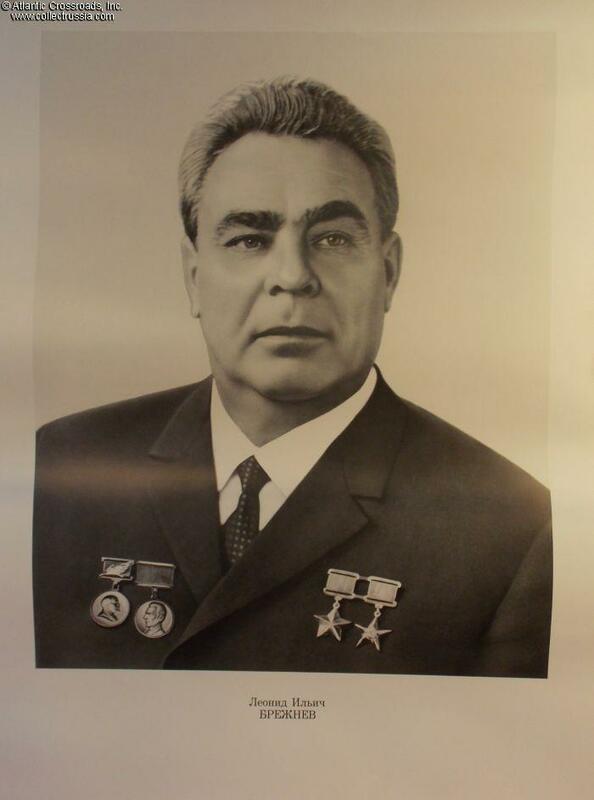 Soviet Premier Leonid Brezhnev, b/w portrait poster, 1976 issue. BIG 16 ¼ x 29 ¼ overall format. Printed on heavy, high quality glossy paper. The caption says simply "Leonid Iliych Brezhenv". The text in the bottom right is information about the publisher: it shows that the poster was printed in 1976 at the Red Proletarian printing house in Moscow. Posters like this one were published in large quantities to hang in governmental offices, schools, hospitals and about any other public place. Of course just like it happened with most other Soviet leaders, after Brezhnev had died he was no longer considered a "classic of Marxism-Leninism". His "cult of personality" was promptly denounced and even his Order of Victory award was revoked. Most of his busts, paintings and posters were discarded or destroyed at the same time - not many have survived to our days, especially in such a nice condition as this one! This poster is from the time when Brezhnev was still the pinnacle of his power, soon after the Soviet triumph in Vietnam and before the Soviet disaster in Afghanistan. He was not yet a decrepit ruin as seen in the later years of his life. Note that he is wearing "just" three Hero Star awards (later he added two more to his already impressive collection). The poster has been rolled for storage (and will be shipped rolled in a sturdy postal tube) but is in mint condition, without any tears, stains, wrinkles or any other damage.